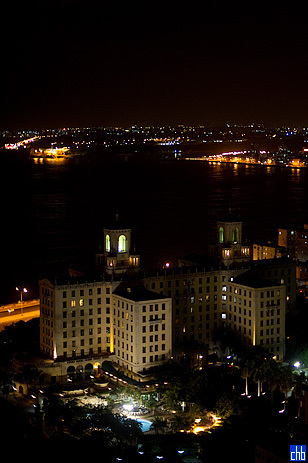 If you want a taste of pre-Revolution Havana & the chance to experience the luxury enjoyed by some of Hollywood’s greatest names, you will find Nacional de Cuba a great choice, particularly if you like memorable evening entertainment & old American cars. 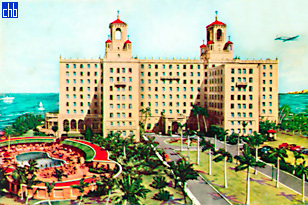 The past guest list at hotel Nacional de Cuba is a who’s who of Hollywood but also includes stellar names like Winston Churchill, Ernest Hemingway & Nat King Cole. 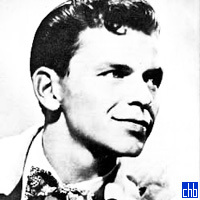 Many rooms have been kept just as they were for their illustrious visitors in the hotel’s heyday of the fifties & sixties & there is plenty of memorabilia to see on the organised tour. 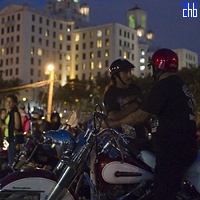 Guests can also enjoy a regular flow of vintage cars from that era along the hotel’s long driveway & there is a classic car show outside the hotel every week. 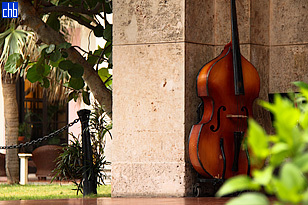 Modern-day entertainment is also a memorable feature of Nacional de Cuba with spectacular shows at its Parisian nightclub & live music on the veranda every night. 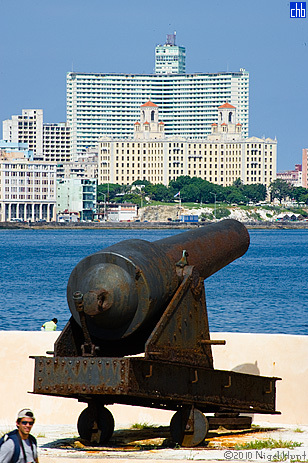 The hotel is also a place where you can unwind in beautifully maintained gardens & enjoy fine views over the sea & Old Havana, which is just a 5-minute taxi ride away. 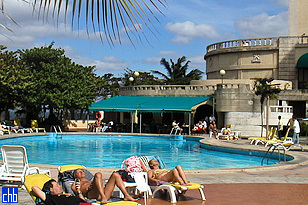 Nacional de Cuba hotel is also only a short walk from Havana’s Malecón or guests can simply relax & cool off in the hotel pool. 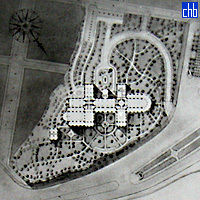 There is a good range of food & drink at Nacional with 4 bars, 2 a la carte restaurants, a snack bar & buffet restaurant. While there is great variety, the food & service standards can vary & the buffet restaurant can get busy, especially at breakfast. However, the drinks are inexpensive & it is highly recommended to enjoy a mojito or pina colada on the beautiful terrace in the evenings. 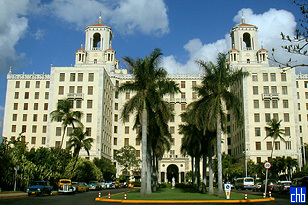 Nacional de Cuba is an elegant old hotel which, while showing signs of its age, continues to have irresistible charm. 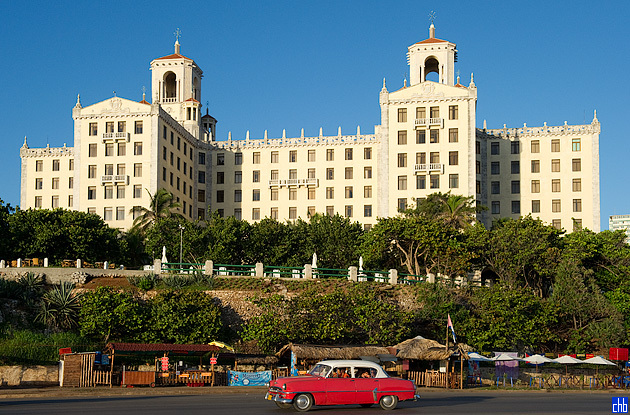 If you want to enjoy the sights & sounds once enjoyed by some of Hollywood’s greatest golden-era stars & see spectacular modern shows, you will have a memorable stay at Nacional de Cuba hotel. 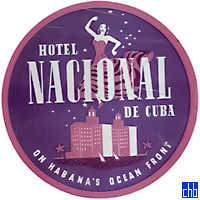 Many of Nacional de Cuba’s rooms have been renovated so don’t be put off by reviews of musty rooms. 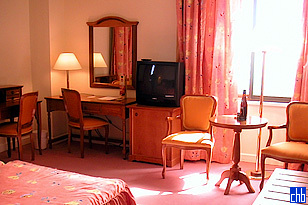 The standard rooms are still generally dated & a little worn but they are clean & comfortable, with double or twin beds. 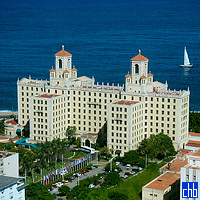 All standard rooms have air conditioning, satellite TV, safe & mini-bar. If you want to enjoy views of the beautifully kept gardens or the ocean, upgrade to a suite. Suites otherwise have the same facilities as standard rooms. With the same facilities as the suite, the 2 bedroom suites have an extra bedroom.